Piece of Paper: Happy Birthday Guylou! Today it's Guylou's birthday! We are celebrating and you can celebrate with us by participating in the DT Guylou's birthday bloghop! It will run until Sunday, October 16 at 11:59 p.m. EST. A winner will be chosen using random.org on Monday.A RAK will be offered, which includes one pack of 4 copic multiliners, one pack of 2 stardust pens, a black memento ink pad, and a $5 gift card to Guylou's Inimitability. In order to win the RAK, you must leave a comment on every stop of the hop AND wish Guylou a happy birthday on her blog. For this card I used Binker. I wanted to use this paper from Maya Designs (love the cupcakes) but I also wanted to use this image. So that's why I created a non-traditional party clown. And to be honest, I'm happy with the way it turned out. Guylou, this card will be on it's way for you soon. I wish you a very happy birthday! And I hope you will have a lovely day! I think your card turned out perfect!! I love the ballons in the soft colors and his shirt and pants matching!! Very pretty! I love the colors and think your card is perfect! I'm sure G will think the same way! Love the flowers and flourishes! Love this card. That clown is so awesome, the colors are fab! I love the way it turned out too.. Love the soft colors and the ripped paper. Lovely card Carmen! Refreshing take on colors here for a clown theme. Kinda vintage inspired! Beautiful card! Love your color scheme and mix of patterned papers!!! What a magical card Carmen! I love the monotone color scheme! Thank you so much Carmen!! Your card is magical and beautiful!!! What an awesome surprise!! You made my day!! Gorgeous card. I love that paper and your coloring and design is phenomenal!! Blinker is just so cute!!! Fantastic card, Carmen! Love the colors and papers and fun image! Great coloring! Great card Carmen! I love the little extras you added! Lovely card, Carmen! I too love the soft colors you used. Happy Birthday to G! 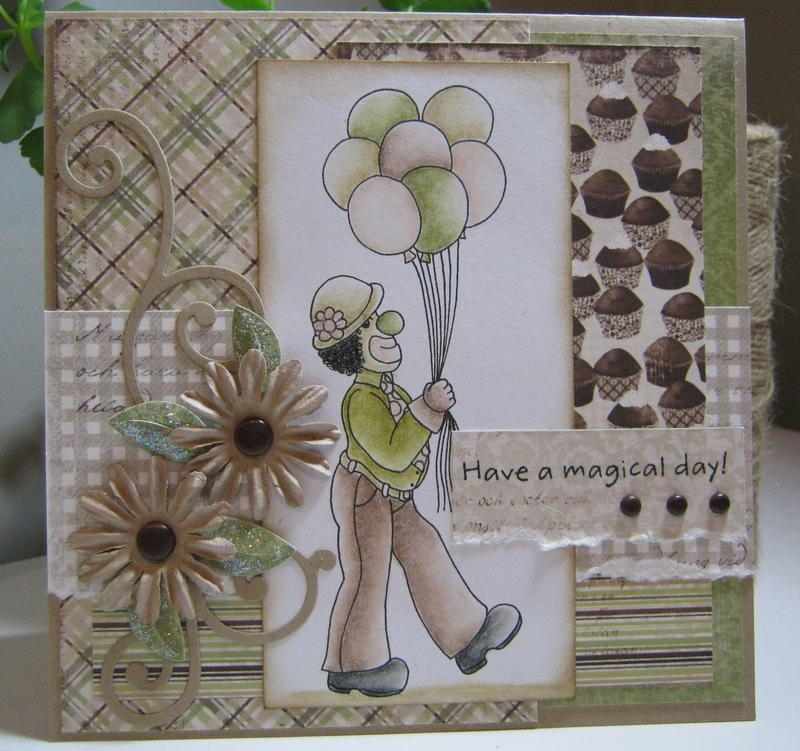 Love, love, love your card...the soft browns and greens are among my favorites. Just love the card, super color combo and LO!!! I really like the monochromatic look with just a punch of color and what a cute image. Wat een mooie kaart Carmen. This is divine! Love the clown and the colors! prachtig kaartje, Car, mooie kleuren heb je gebruikt! en leuke stempel! Love your card for Guylou, Carmen! The image seems to be perfect for your subtle color choice. 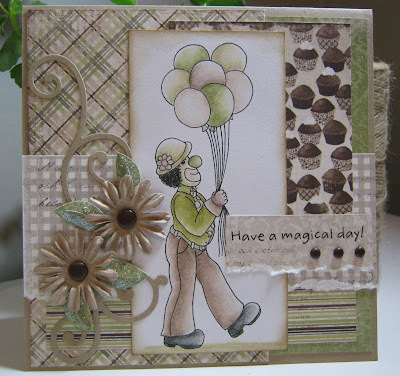 I love the almost sepia tones you used on this card. Very pretty!